Patrol Officers Eduardo Colon and Long Dang, from the Traffic Unit, go up and beyond! During a very frigid cold spell in January, these officers were spotlighted on Fox 8 for their efforts to take care of the many people who are homeless in the downtown area. Officers Colon and Dang acquired blankets from St Vincent Charity Hospital and sought out people living on the streets to keep them warm. Colon and Dang understand that many refuse to go to shelters and that some of them suffer from mental health issues. So the officers not only gave them blankets but made certain to check on their welfare, seeing how those on the street were coping with the weather and if any emergency actions were needed to ensure their safety. These two officers regularly check on people in the homeless population, bringing them food and often paying for supplies out of their own pockets. “They appreciate it when you come up to them, talk to them not like a police officer to a person, but as a person to a person,” said Officer Dang. These officers, as well as the entire CPD Traffic Unit, truly care about those in need in our community and go out of their way to ensure the safety all of our community. 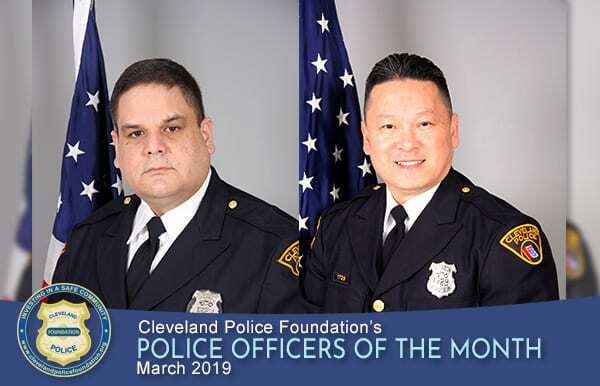 It is because of their compassion for their fellow man and devotion to their profession that the Cleveland Police Foundation is proud to name Patrol Officers Eduardo Colon and Long Dang as Police Officers of the Month for March 2019. The Cleveland Police Foundation – in partnership with the Cleveland Division of Police, Cleveland Police Patrolmen’s Association, and the Fraternal Order of Police Cleveland Lodge 8 – is proud of the Police Officer of the Month program. The program’s purpose is to recognize members of the Cleveland Division of Police who not only perform their duties in an exemplary and extraordinary manner, but also excel in efforts that are consistent with a major tenet of the CPF’s mission to strengthen the bonds between citizens and police officers… building bridges, creating opportunities for dialogue, and forging positive relationships within the community. Already aware that officers in the Cleveland Division of Police routinely go out of their way to help their fellow citizens, committee members are not surprised by the large number of candidates. With so many outstanding officers, selecting one recipient per month proved to be a somewhat daunting task. Police officers across this great country perform similar deeds day-in and day-out, with little fanfare and really not seeking, nor even wanting recognition. We commend these officers for their compassion and personal commitment to making our city a better place to live.